Who Will Win in the Exploding Drone Ecosystem? 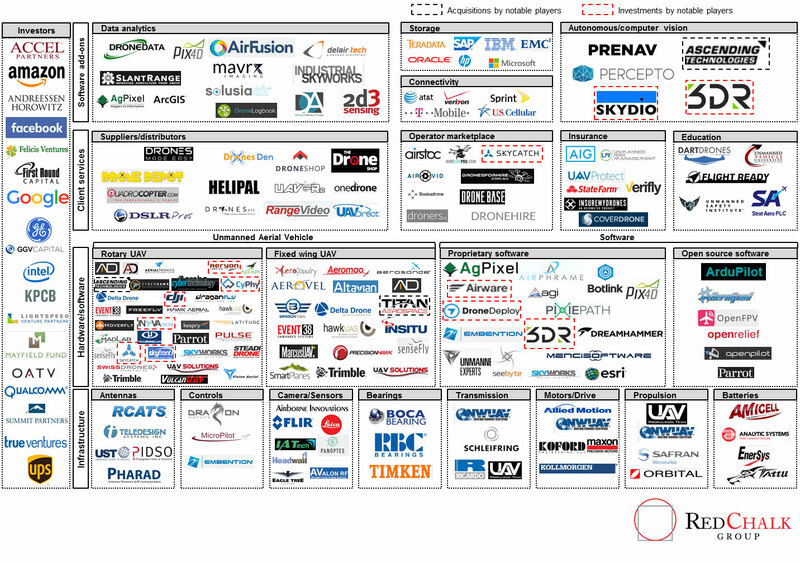 Who will succeed in the burgeoning and progressively complex drone ecosystem? Advances in commercial UAV technology (commercial drones) have rapidly unlocked new applications from precision agriculture to infrastructure surveillance as the prospect of significant revenue pools, enhanced business models, and market extensions have attracted a variety of industrial and financial players who are seeking footholds in the drone ecosystem with aspirations to lead and innovate – or simply hedge. The resulting fragmented ecosystem consists of a diverse set of market participants ranging from historically upstream chipset vendors to downstream services vendors such as P&C insurers. See Exhibit 1. Naturally, investors are confronted with a problematic proposition: who will succeed in the burgeoning and progressively complex drone ecosystem? While Intel has been exceptionally active through a wide scope / scale strategy, other players are eager to pursue the frontier landscape of drone technology ranging from those with commercial and operational objectives like General Electric and UPS, to companies tied to technological advancement and product integration like Google, Facebook, Amazon, and Qualcomm. 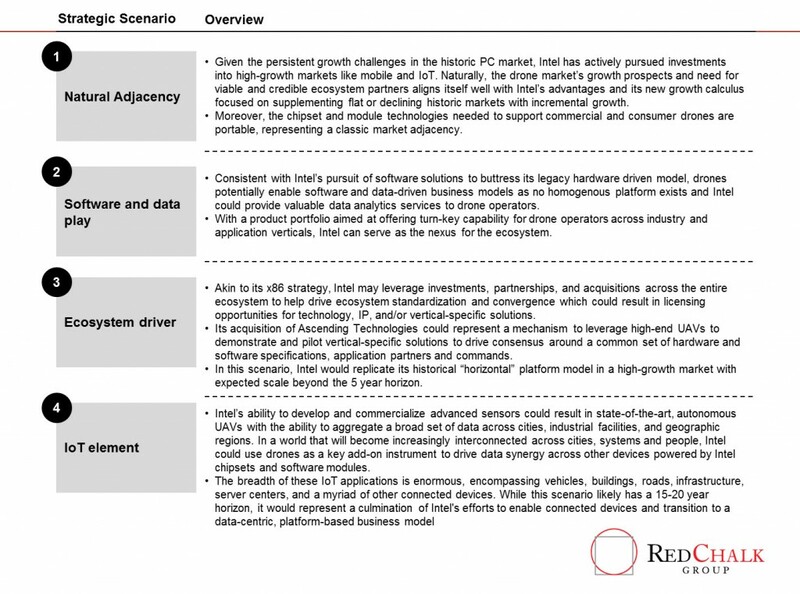 Strategies have varied by player but the aggregate trend across top investors indicates a concentration of activity in the rotary UAV and proprietary software segments of the ecosystem – this implies a necessity for developing core segments of the drone value chain before expanding into value added segments such as data analytics and drone insurance software. As an outlier, Facebook, pursued a core drone player through the acquisition of fixed wing UAV manufacturer Titan Aerospace for $60M, likely with the objective of utilizing drones as an infrastructure element to maintain connectivity for the controversial “Internet.org” project. Qualcomm deviates from general trend in that while the majority of investors have made large scale acquisitions of prominent drone players, Qualcomm has kept its investments relatively small – but with higher frequency – funding approximately ten players, with major drone players like 3DR pulling in the most cash. How will the ecosystem evolve to adjust for vertical specific solutions across key markets? What business models will succeed for ancillary players given the near-term fragmentation? When will profit pools solidify and across which discrete segments of the value chain? Which major operating companies are best positioned to drive value through UAV data?